A crowd waits outside Massey Hall before the Council of Canadian’s “Shout Out for Social Justice!” event. Last night, a series of anti-G20 speakers took the stage at Massey Hall to tell us what’s wrong with the world. Hosted by the the Council of Canadians, “Shout Out for Global Justice!” featured an impressive list of speakers that included Dr. Vandana Shiva, Amy Goodman, Naomi Klein, and Maude Barlow. “Shout Out for Global Justice!” was a political pep-talk—the protest movement’s more-or-less official opening ceremonies. The Raging Asian Women (RAW) started the show with a Taiko drum performance, which led into a three-hour agree-a-thon, complete with ready applause and standing ovations. This was the anti-G20 contingent’s best shot at creating some sort of an identity, and the speeches indeed captured some common themes. Good: the Cochabamba accord, Indigenous rights, water as a human right, employment, and the environment. Bad: BP, militarization, the criminalization of dissent, the tar sands (“Canada’s Mordor“), the WTO, the IMF, the fake lake, and the World Bank. Also bad: the police presence throughout the city. But the main evil last night was the G20 itself. 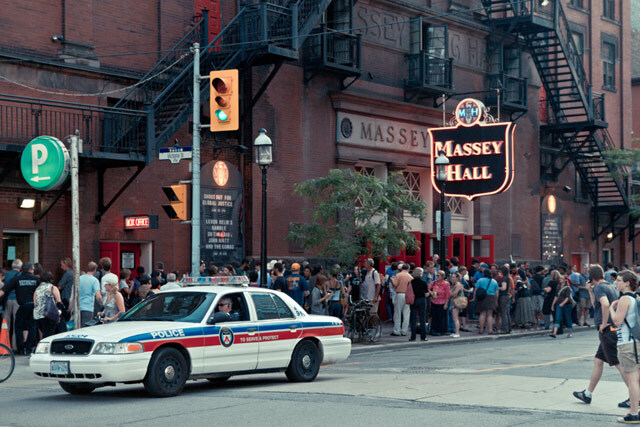 Security monitors the box office outside of Massey Hall before the event. All speakers argued that the G20 is illegitimate and unaccountable. Rousing the sympathetic crowds, Barlow, chair of the Council of Canadians, said we should just “scrap this damn summit.” Still, the general protest movement seems undecided about the endgame—should the G20 change its agenda, or should the G20 go away? Since it’s already a forum of power, should we use it, or lose it? The biggest hit of the night was local girl Klein, who complained about the effect the summit is having on the city, saying, “I’d take the garbage strike over the G20 any day of the week.” She then invited the audience to follow her down to Allan Gardens after the event to support the nascent tent city. The humble tent city was a bit stunned to receive so many visitors, who began chanting “G8! G20! They few! We many!” The megaphones came out, and protesters were invited to stay the night. A few dozen pop-up “red tents” had been set up for some sleepers, while others sat strumming guitars in the grass. Some basic planning had gone into the site: there was water, food, a medic tent, a contingent of security guards, and “mental medics.” Established bathroom facilities were the one amenity noticeable by their absence. The protest movement disagrees with some very disagreeable things. The event’s speakers drew on the long narrative of capitalism—militarization, commodification, de-regulation—as fuel for the protest movement’s weekend of dissent. This broad banner, along with the goal of scrapping the G20, is an ambitious agenda that at times last night seemed like a catch-all for anger and general dissatisfaction. (See our more in-depth comments on protesters.) As political movements go, it’s hard to pin this one down to a concrete issue and a concrete solution. Footage from “Shout Out for Global Justice!” is available at Rabble‘s website.